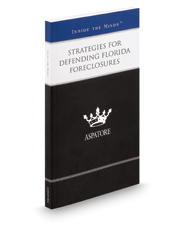 Strategies for Defending Florida Foreclosures provides an authoritative, insider's perspective on the devastating economic impact of the state's real estate crisis and presents winning strategies for challenging foreclosure actions. Real property and litigation experts from across the state explain the factors that drove up the sky-rocketing rates of foreclosure and guide the reader through the process for successfully fighting these lawsuits. These professionals discuss how effective motion practice can buy time during a foreclosure action, examine alternatives to foreclosure through the Home Affordable Modification Program (HAMP) and the Homeowner Affordable Foreclosure Alternatives (HAFA) among other options, and highlight the critical notice requirements of Fannie/Freddie mortgage's paragraph 22. The different niches represented and the breadth of perspectives presented enable readers to get inside some of the great legal minds of today, as these experienced lawyers offer up their thoughts on the keys to success within this dynamic field.